FORE!! 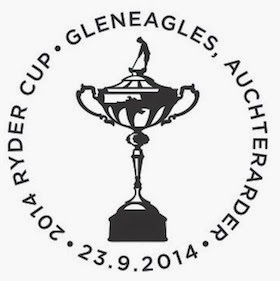 Advance notice of Ryder Cup slogan postmark. From 23 September Royal Mail will be selling "a stunning limited edition Medal Cover" which they hope will appeal to golfers worldwide. 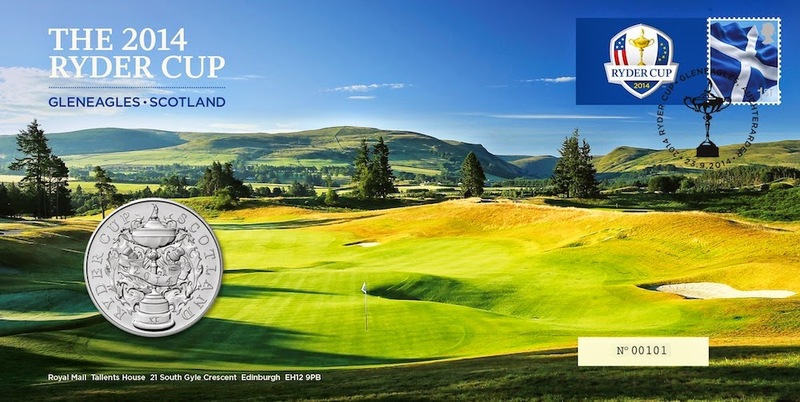 The cover commemorates the 40th Ryder Cup being held this year at Gleneagles in Scotland. UPDATE 28 August: Although it seems that the logo is on a label affixed to the stamp (Smilers-style) no Smilers sheets or Commemorative sheets have been produced for sale. So it seems likely that there will be two versions of this slogan, one with an one without a logo - let us know what you find. In the United Kingdom there are two types of ink-jet cancelling machines in use. The 'Delivered by Royal Mail' add-on, and slogans with logos, are generally applied by Integrated Mail Processors (IMP). Intelligent Letter Sorting Machines (iLSM) generally do not include logos and don't add the 'Delivered by ..' slogan, although they do produce Prostate Cancer slogans with the figure of a man, and did produce the boxed script 'Homecoming Scotland' slogan, with the remainder being just text. More about postmarking later. Meanwhile thanks again to Royal Mail's media department for giving us 3 weeks' notice of this slogan! Several examples of the Ryder Cup slogan have been found, and they show that the logo is now produced by both types of machine. 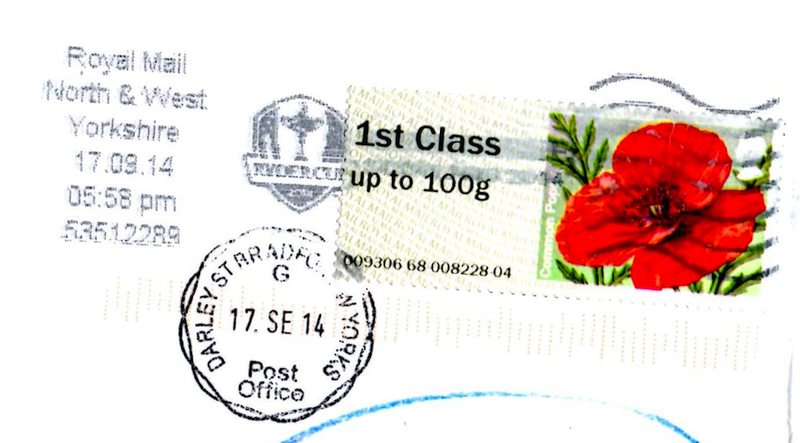 Unfortunately postmarks don't show on Post and Go stamps and labels, so the North & West Yorkshire MC slogan (17 September) is illegible. Looks like the stamp/label combination comes from a RM 'Smilers'-type sheet. Any idea if they are likely to make this sheet available for purchase? I thought that as well ! I've just this minute finished the phone call that confirmed that there are no other products for sale. The logo alongside the stamp does appear to be on a Smilers-type label but I couldn't even find out whether it was a perforated label or not.